I focus primarily on Young Adult, Middle Grade, and Children's books, but my tastes are eclectic, so I change things up frequently! 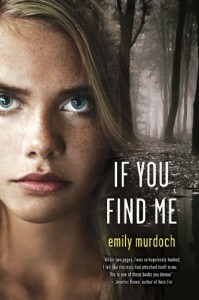 Emily Murdoch's If You Find Me is unique in that it has a slow burning intensity that pulls the reader in until they've completely fallen in love with Carey and Jenessa without even realizing it was happening. If You Find Me tells the heartbreaking story of Carey and her little sister, Jenessa, who have been kept away from people and civilization - and often completely alone in the wilderness - by their addict mother. The girls often fend for themselves, as their mother regularly disappears for long stretches of time, but, as the novel opens, they're nearing the end of their food stores and Carey is starting to worry about what will happen if their mother doesn't reappear. Things take a turn when a social worker and Carey's estranged father find the girls, as directed in a letter by Carey's mother, and take them back to live with him. The girls are thankful that they're still together and that they're warm and fed, but things are still complicated. Jenessa still refuses to speak (she's been selectively mute sincesomething happened to the girls during their time in the wilderness) and Carey finds that, while she isn't behind academically, socially she's an entirely different wavelength from her peers. She's either too mature or too naive and she often struggles to adjust to the new world she's so suddenly entered. Carey and Jenessa are two of my absolute favorite characters. They felt so real to me that I often forgot that they weren't real people. I was so caught up in their story that I found myself telling anyone who would listen about what was happening to them as the story progressed and I often referred to them as if they were real people. I loved Carey's complexity. I think part of the reason that she felt so realistic was that she was complicated and unsure and often contradicted herself, as I imagine someone who grew up like she did would. At different points in the novel, she either hated, felt love for, or missed her mother. As an outside observer, I had no love for Carey's mother and what she put the girls through, but I could definitely see how things wouldn't be so easily black and white for Carey. After all, though she knew on an intellectual level that what her mother did was wrong, it's often extremely difficult for an individual, especially a young person, to completely hate their parent, especially when that parent is one of the only people they've ever had contact with. I really enjoyed the novel's secondary characters as well, especially Carey's father. He's definitely an important character, but he never really says much nor does Carey talk about him extensively, but every time he is mentioned or appears in the book, the passage had weight and meaning. Even if I hadn't been tied to the novel by my love of Carey and her sister, the mystery element - which is directly tied to Jenessa's selective mutism - would have made it hard for me to set If You Find Me aside. I had to know what happened to the girls that had affected their lives so deeply, especially when their lives were already so difficult and unusual. I felt that I had to know, yet I was afraid to find out because I was so emotionally invested in the characters. Lastly, I have to mention the romantic aspects of this novel. It might seem that their is no place for romance in If You Find Me next to the novel's premise and emotional weight, but that isn't the case. The romance in this novel isn't at all random or an attempt to appease or attract romance readers - it has meaning and fits beautifully. 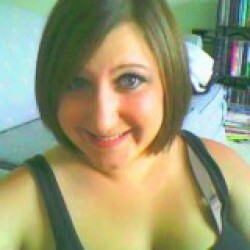 I highly recommend Murdoch's If You Find Me and will definitely be reading her future offerings. This is a book that I'll no doubt be constantly pushing on my fellow readers!